Smart real time alerts to keep you notified of critical changes that could affect your sales. Monitor your Amazon Sales, profits and Inventory from inside SellerApp, to get the actionable insights and metrics for your Amazon business. Your listings are monitored even while you are asleep. Get notified for even the slighest change that could affect your business. We notify you as soon Amazon makes a change in your listing or if a competitor changes something. We are here to help. Our Amazon experts help you in every step of your way to ensure your success. Worried of hijackers stealing your sales? ASIN piggybacking - the legally approved Amazon business strategy could prove to be a dirty play for a private labeller, or even a big brand. Protect the trust you’ve built for your band by constantly monitoring your listing for hijackers and cheap knockoffs. Don’t let counterfeit and fraudsters steal your Amazon sales and hamper the brand trust build on Amazon. Get notified the very instant a hijacker attacks your listing. Even if you are a big brand, the quality of your listing decides if your product qualifies for a buy. SellerApp’s Listing Quality Alert tracks the critical parts of your listing to notify you each time there is a variation in the Listing Quality Index, SellerApp’s in-house listing analysis score. 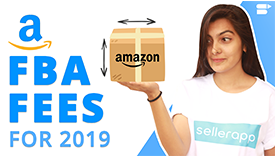 A small change as the indexing of your main keyword or critical ones like Amazon silently taking down your best selling listing - SellerApp keeps you informed of all these changes. Even track the changes in your competitors’ listings! Do negative reviews bother you ? The latest negative feedback could have the most impact on your sales. While reviews are hard to get on Amazon, the biggest fear is negative feedback which could affect your sales, and even the buybox. Get instant notifications on every product review. SellerApp’s Alerts notify you each time there is feedback, for sellers to instantly react when there are damaging negative feedback that could affect your sales. Stop checking for new reviews manually, instead focus on reacting to them. Worried if you are losing your sales due to your competitors' pricing changes? With the influx in the seller crowd, competitive pricing is crucial to winning the Buy Box. Constantly monitoring the pricing strategies of your competitors' becomes critical when your listing is hijacked. Monitor sellers you are losing the buybox to and the reason you are losing it, while keeping a track of their pricing strategies. Identify the products you could lose the buybox due to the inventory levels. Get notified instantly when you lose the buy-box. Low Inventory levels can shadow your Amazon listing to a level where no one can reach your listing even if they wanted to. Do you still manually monitor your business metrics ? Why do I need to set up product alerts on Amazon to monitor my listings? Can I add more functionalities to the SellerApp product alerts? I m currently the only seller. I have no competition. Do I still need to set up alerts? How quickly are violations detected eg. hijackers on my listing? Is my data secure? How safe is my account?